The one session that stuck with me, given the fact that I have the opportunity to work with community bankers on their website and related online/digital/social media efforts, was the opening session on the “.bank” domain name initiative. For those of you who may not be aware, very soon banks will be able to register the .bank version of their domain name, much like they have reserved the .com, .net or maybe even .org versions in the past. I’ve been following this issue for some time now and am getting questions several times a month from bank customers (and friends in the industry) but still didn’t really know much about the process, cost or other requirements… until now. Kicking off the conference was Doug Johnson, Senior Vice President and Senior Advisor, Payments and Cybersecurity Policy with the American Bankers Association. His session, entitled .Bank: Will You Be Ready? provided a great overview of the history on the domain name issue, as well as some key things that community bankers should be doing now to prepare themselves. As you will read below, there are still some unknowns that are yet to be determined, but the ABA has created a resource on their website at www.aba.com/dotbank where you can register for news and updates as things begin to become finalized. The ABA, in concert with the Financial Services Roundtable, created a new LLC called fTLD Registry Services, LLC, which has received approval to operate the .bank (and .insurance) domain name extensions. The purpose of this entity is to help with the management of eligibility standards around who can register and operate under these new extensions. What I didn’t realize is that the .bank extension is ready to go today, but they are intentionally rolling it out slowly to ensure appropriate adoption and review. At the time of this post, it appears there are three main dates to be thinking about as you plan for your .bank/.insurance efforts. May 18, 2015 – Get your domain names trademarked at the USPTO (United States Patent and Trade Office) and register those trademarks with the ICANN’s (Internet Corporation for Assigned Names and Numbers) Trademark Clearinghouse by May 18 so when that date arrived , you can register your domains during the Sunrise Period that is described below. This is basically the part of your website address that comes before the .com (“yourbankname” in the example given above). When it comes time to request the yourbankname.bank, having the domain trademarked and registered in the Clearinghouse will allow you to avoid competing with non-trademark holders for the same domain later in the registration process. It was suggested to contact an attorney to get this done for you, file the necessary documents with the USPTO, and at least start the process. Chances are it won’t be done in time for registrations later this year, but having it in the works is better than not to protect your intellectual property in other domains as well. May 18 – June 16, 2015 – This was referred to as the Sunrise Period where trademark holders who have registered their bank’s trademark with ICANN’s Trademark Clearinghouse may purchase domains. June 24, 2015 – This is when they are planning on making the .bank and .insurance domains generally available for registration. While not as much of a “free-for-all” as the other non-fTLD managed domain extensions, it will be a first-come-first-serve process as well. Any chartered bank will be eligible to register for their .bank domains (and if they have an insurance subsidiary, the .insurance versions). Be sure to act quickly if you want to ensure that you get your name reserved. fTLD is only able to set the wholesale cost of the .bank and .insurance extensions and banks will need to purchase these through authorized domain registrars, just like purchasing any other domain name. The names of some of the approved registrars are now available at www.ftld.org, the governing body’s website. There likely will be other registrars able to offer .bank domains down the road as well. While retail pricing has not yet been finalized, it’s safe to say that .bank and .insurance domains will be significantly more expensive than your typical $12/year .com domain name. Keep in mind, these numbers are subject to change, but ABA and fTLD is committed to keeping the price as close to $1,000 (annual) as possible. Some registrars may bundle other services like domain privacy, SSL certificates or similar services that will increase the cost. It’s my hope that competitive pressure will keep costs down. One interesting thing that he did mention was they are “taking off the table” some of the more common bank names so as to protect the consumer and not cause confusion (or get into a bidding war) for names like First National, First American, United Bank and other common bank names. Even american.bank will remain unavailable for purchase. It’s estimated there will be about 60 or so of these names and Doug indicated the list of these names will be announced in the near future. So, What’s a Banker to Do??? First off, be sure to subscribe at www.aba.com/dotbank to make sure that you get updates as they happen. You can also keep up over at www.ftld.org, the governing body’s website or follow them on Twitter (@ftld_registery). This way you’ll be sure to know as things change and news is released. If you’ve not done so, consider getting a trademark from the U.S. Patent and Trademark Office (www.uspto.gov) on your domain name. While the likelihood of a new application getting approved in the next few months is virtually impossible, you should start the process now with your attorney. Chances are you’ll spend $500-$1,000, depending on attorney fees, but I personally think it’s worth it. That way if there ever is a dispute, you’ll be better prepared form a legal perspective, especially if someone goes out and snags some of the other extension versions of your domain (like .mortgage, .loan, .savings, etc.). Plus, if/once the trademark is approved, it’s effective back to the date of application, so the sooner you start the process the better. Internally, you’ll want to start putting together a team or task-force that has representation from marketing, IT, your website/host provider, compliance/legal and senior management. You may also want to get input from your core processor and online banking provider to see if you can use the .bank for part of your online banking efforts. You’ll also want to brainstorm on what other extensions (in addition to .bank or .insurance) you may want to register, even if only from a defensive standpoint. Good question! Just because banks will have the ability to register their .bank and .insurance extensions may not mean you “have” to. In fact, this question was posed by more than one of the participants, especially given many of them were under $500 million in assets (some even under $100 million). Many community banks have tight budgets and if you add up the costs for a .bank, .insurance, a handful of other “related” domains like .mortgage or .loans a bank could be looking at annual costs of $3,000 - $5,000 or more! That’s an ongoing line item for something that likely won’t be much of a revenue generator, so your ROI on this investment is going to be tough to prove at first. But, think about the alternative… What if you skip the .bank or .insurance registration, save your money and keep plugging along with your good ‘ole .com domain? It’s hard to say what consumer preference will dictate, but at some point the “million dollar question” is whether it will become a consumer expectation (because of perceived security or online privacy) that you must use the .bank extension, or risk being considered insecure or outdated? Honestly, I’m on the fence about this one and not sure what will become consumer preference. But one thing’s for sure, I’d recommend at least getting what you can afford for the first year and then let consumer preference evolve over the next 12 months and re-evaluate a year from now. 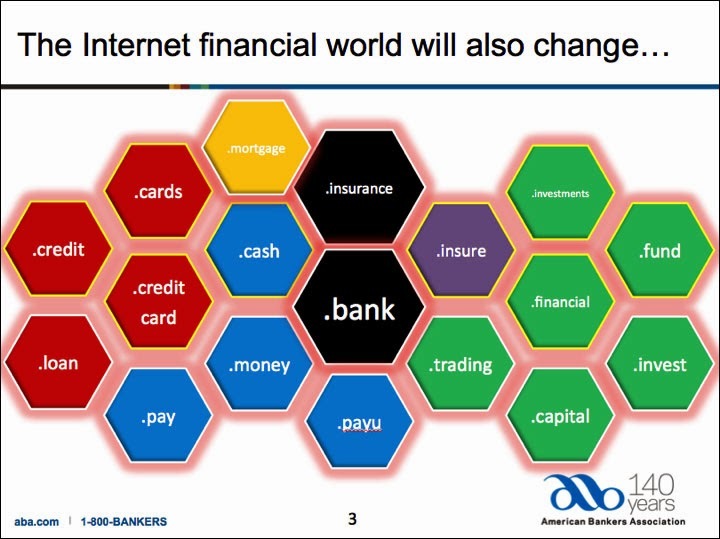 Will the industry really be able to make these .bank and .insurance branded domains more secure? If this becomes reality and they protect customers from fraud (and the expense of cleaning things up when fraud happens), then you may have your ROI right there. Time will only tell, as this continues to develop. But as with anything in technology, the only certain part in all of this is that we’ll likely see more changes before the dust settles. At this point you need to be paying attention, asking questions and setting aside some budget to make sure you are at least part of the party when it starts. I’d be interested in your thoughts, so feel free to comment or get in touch. Let me know what you’re thinking and to what extent you’ll be embracing the .bank (and others) domain extensions in 2015.